I’m currently striving towards getting my personal bests up with like deadlifts and stuff and keeping a good cardio balance. I’m currently trying to move towards the army, so I’m trying to keep fit constantly, so I’m here pretty much everyday to keep my cardio and strength pieces up. My first experience at CrossFit was daunting, but once you come past your first session it’s pretty awesome. All the members are great and all the workouts are pretty fun. Jeff, Lesley, Dalton, Becks have been absolutely awesome since I’ve started and all the members as well. They come around and tweak something that you’ve messed up on and that helps a lot having that experience of them coming around. And the members are awesome as well, they’re really welcoming. I like the cardio and the more intense workouts instead of going to a normal conventional gym and just standing there going like that (curls) and stuff. I just like it, the buzz you get from coming and you don’t know what you’re doing everyday that’s the main thing I like doing. Yeah, I’d say just do it I was in the same boat, I was on the fence when I first joined I was like should I do it? But then I did it and it’s been- it’s really changed my life. Member Spotlight Monday – Harrison Interview"I'm currently trying to go towards the army, I'm trying to keep fit constantly so I'm here pretty much everyday"
Having a husband who works away during the week, it was really important to me to be able to come in and train during school hours. So, it’s really awesome that there are a whole range of classes that I can come in all week long that suit my needs. I had a goal last year to try and fix some back problems so I joined a big gym here in Dunedin and worked with a personal trainer. He left and suggested that I come and try CrossFit, so I came down and I’ve been working on my upper body strength and core strength ever since. I was really nervous, more nervous that I am right now (laughs). I had just been used to working one on one with a personal trainer and in a big gym where no one notices you, no one cares what you doing. So to walk into a group setting was pretty terrifying, but I just really felt like I was gonna struggle to keep up with all the athletes in here and I was just going to be left at the back to my own devises, but my nerves were pretty quickly calmed. Everyone was really friendly and helped me find equipment and get sorted and the coaches just really took me under their wing. Yeah I don’t have a big goal here, I just feel like each day that I walk in I’m trying to work towards really small milestones. Before I came here I couldn’t even do one pull up, now I can string ten or eleven together. I just have really small goals like unassisted handstand push-ups, and muscle ups which are things I just never have considered ever being able to do in my life. What do you think of the coaches and other members? They are just a really awesome bunch of people, they love having a laugh and a bit of a joke around. They’re really supportive, really encouraging. They don’t really care what you’re lifting, or how fast you’re doing the workout, they’re just always cheering you on, they’ve always got your back. The coaches are really passionate, they get really excited when you hit a PB (personal best) or tick off a milestone. As a former CrossFit skeptic, I’d say don’t knock it till you try it. Don’t listen to anything that you might hear about it, and make up your own opinion by coming in. I just heard lots of rubbish being spoken about CrossFit and I listened to it, but I’m happily eating my words now. It’s definitely nothing like what I had heard, it’s the complete opposite, I love it. What goals are you striving to achieve with CrossFit? I hadn’t been doing anything for about 10 years, so felt like I needed to do a bit of exercise and seen a few photos, didn’t like the way I looked so, wanted to get back in and get my fitness up. Especially with a couple of kids, I wanted to be able to run around without losing my breath and being able to keep up with them. My first experience at CrossFit was a bit daunting. When I first came along I didn’t know what to think. In a group setting, I had done nothing like that before, it was completely out of my league. Basically I just did my thing and thought I was going to be way out of my depth but the coaches here are friendly and everyone else here, the other athletes that come here, are all friendly. And they all made me feel really comfortable. Basically, they just scaled things to my ability. Where I thought I would have to start off doing what everyone else was doing, they just programmed different techniques, or completely different movements but in a similar fashion, just so i could get a workout done. I just love the atmosphere, I love the community feel, especially at this gym here. Everyone is just friendly and it’s a great vibe to come along and just work out. Even days where you don’t even feel like working out, you just turn up and once you’re here and you’ve got your gear on and you just jump into the class just everyone else and the buzz and the vibe you get off everyone else, just feeding off each other, you just end up tending to, even if your not 100% even if you just go 50% at it, you still end up walking away with a big smile on your face and just loving the fact that you’ve been here and you’ve done a good workout at the end of the day. Just give it a go. Come on in, try it out. I know it’s going to be daunting the first time you do it, but once you’re here you get over that sort of hurdle. What are you striving to achieve with CrossFit? I did group fitness for quite a while and I wanted to just increase my strength. I wanted to better the movements I was doing. I really wanted to come to try and learn to do pull ups and I have achieved that goal, and along with it I’ve made a lot of strength and I’m the fittest I’ve ever been in my whole 46 years. Coming to class was a little bit daunting, I started off with a women’s class and I used to watch the CrossFit class going and I actually couldn’t wait to get in there. So I didn’t last in the women’s very long, which was a great class at the time but yeah it was just a great experience. They treat you like athletes from day one which is quite good. They were just friendly and encouraging and they show you a really good technique, and they help you a lot with injuries as well. It encompasses all sports, the strength training, the gymnastics, what it does to you, what it involves with your body, and it’s a really good methodology to get fit and stay fit. I have a very physically and mentally demanding job and CrossFit is my big stress relief for me and keeps us focused. Is there any advice that you would give to someone who is on the fence about joining? I have no specific sporting goals at the moment but a huge priority to me is to live a happy and healthy lifestyle, and CrossFit definitely allows me to do that. 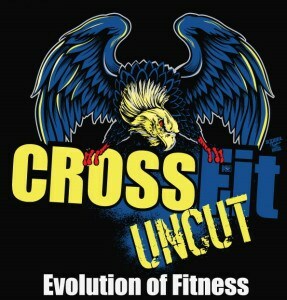 How did you find the coaches and other members when you first joined CrossFit Uncut? The coaches are awesome and work around any injuries that you’ve got and the members are just incredible and some of my best friends that I have now are members from this gym. I enjoy that there’s lots of different movements with CrossFit, and lots of different things that you can get good at, like gymnastics, and strength training, and cardio which I’m not very good at (laughs). But I’ve tried lots of different other sports and this is definitely the most fit I’ve ever been, and the most well-rounded athlete I’ve ever been. I know I’m gonna have fun every single night, and just know that I can be silly and dance and talk to my friends and it’s just really lighthearted but I still get a really good workout. Definitely just come and try it because everyone thinks they’re not fit enough, or not strong enough to do it, but you 100% are, and within a few weeks you’ll notice yourself getting fitter and stronger and you’ll just feel amazing.